It seems 1967 was a simple time. 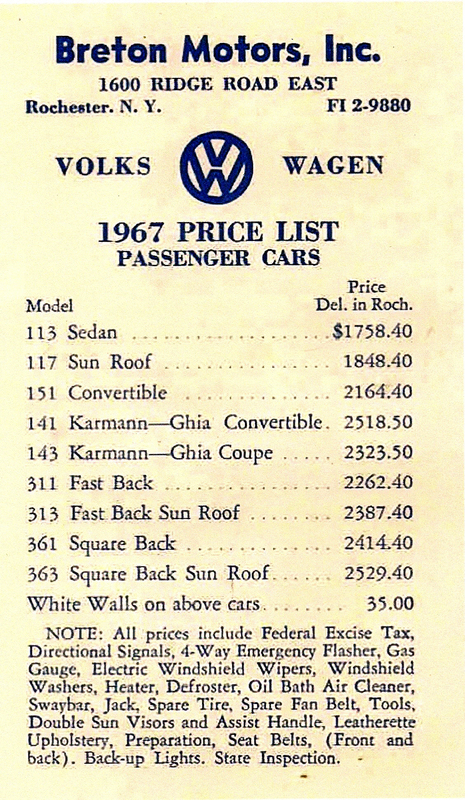 One thing is for sure, the ’67 Volkswagen Beetle was sure less expensive than today’s modern cars. I think a recent quote from Lenny Copp of WCCR sums it up well. Can I put in a sun roof or make it a convertable top? You could, yes. I’m not a fan of cutting German metal. Hello, Nicole…You ask if you could make your car into a convertible. The answer is you can’t. Convertible Beetles were built at a different factory than the Sedans. This is because of their special body. The body frame is strengthened by special support tubing. As well, almost everything about the body is distinctive. Even the louvers which induct air to the engine are removed and the decklid, instead, is louvered. The solution is to find and buy a Convertible. Since ’67 Beetles did not come with the ragroof, the resultant alteration would be a car which is essentially valueless–except to the owner. Even to take a metal crank-back sunroof and graft it into a car which didn’t come with that feature is altering the value of the car downward. I hate to be the bearer of bad news, but such alterations follow a car almost like a “criminal record”. As well…such an altered vehicle is now removed from a possible restoration project to factory standards. Since vintage VWs are rapidly becoming scarce, the feeling is that remaining cars should be kept in as original a condition as possible. That way, they retain and accrue value. Wow, I’d love a sliding sun roof car. But can you imagine the work and cost of cutting your car to do an upgrade/instal. ? And the chance it would possibly have a mistake, causing a musty interior after catching a storm someplace on way to, or from….. Hmmm, I think I’d go with Eric, and leave the metal in place….. Agreed! Don’t cut the metal. my 67 has a cavernous hole in the hard roof. it was turned Baja and some one thought it would look cool with a big rectangular opening covered with a snap on tonneau. I have been scratching my head for two years on how to correct it, of course the wife wants the folding rag, but the only cost effective solution is to re-do whats there. Hi.. How much can I get for a Vintage 1961 Volkswagen beetle? My first new car was a 1967 VW. The price of that car was over 50% of my yearly teaching salary so… about the same as car prices today. loved that car! Our family has had at least 4 of them over the years.